Available in Blue, Sapphire Blue, Green, Hazel, Misty Grey and Violet. You will be able to select your colour choice when entering your prescription details. 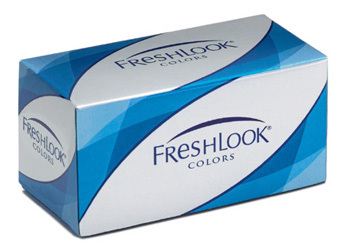 2 lenses per box @ $21.40 per box. Minimum order 6 boxes. An opaque lens also suitable for those with darker eyes, the Freshlook Colors allows a lens wearer a complete change of eye colour, giving a vivid, natural result along with crisp vision and lasting comfort.